Winter is not the time of year I expect to hear about new running records. But that is exactly what happened in late January. First there is Ron Hill, a 78-year old former Olympian who lives in England. Ron was a running streaker who had run at least one mile every day. During a run in late January, Ron started having pains in his heart. 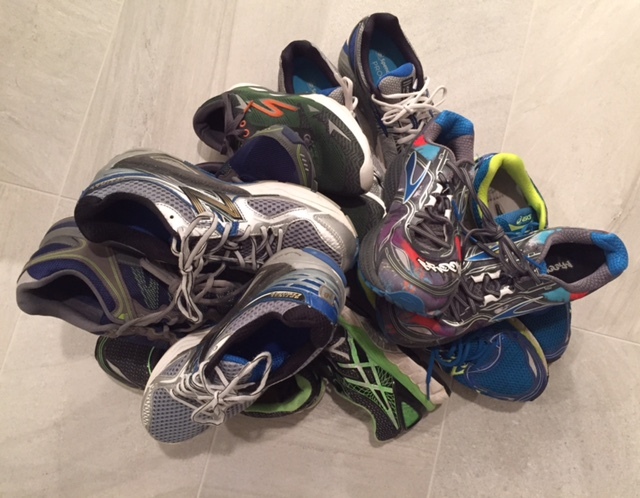 Ron was concerned about his wife and family so he decided it was time to hang up his running shoes and end his streak at 52 years and 39 days. I would call Ron the Cal Ripken of running. Although Cal’s record for most consecutive baseball games played will probably stand for a long time, there are a number of people who could break Ron’s impressive record. I wrote about the US Running Streak Association (USRSA) a year ago because I was following the running streaks of several runners (Did They Make It?). In looking at the current active streak list on the USRSA’s web site, I saw 66-year-old Jon Sutherland’s streak is over 47 1/2 years. As long as Jon stays healthy, he has a good chance of breaking Ron’s streak record in less than 5 years. In the meantime, I hope Ron basks in the glory of having the longest streak record. That is one heck of an achievement. The other records set at the end of January were all associated with the 2017 World Marathon Challenge. I wrote about the World Marathon Challenge at the end of 2015 (7x7x7). Participants run 7 marathons on 7 continents in 7 days. If you think about it, the World Marathon Challenge is also a running streak of sorts. The only difference is that it ends after 7 days (though I am sure somebody somewhere is thinking about how many days in a row they could run a marathon, if they haven’t tried it already). When I wrote about this challenge last year, I thought it was a flash in the pan (the price alone would deter a lot of people). But the number of runners has grown every year with only 9 men and 1 woman in the first year (2015) to this year’s challenge with 22 men and 9 women. The records set with this year’s participants are impressive. Sinead Kane from Ireland became the first blind person, guided by John O’Regan, to complete 7 marathons on 7 continents in 7 days. Guoping Xie set a new world record for women by completing 7 marathons on 7 continents in 6 days 8 hours and 30 minutes. Nahila Hernandez became the first woman to run an ultra marathon (50K or 31.0686 miles) on all 7 continents in 7 days. And to think there was a time when women were not allowed to participate in the marathon because there was a fear it would physically harm them. But the big record was the one set by Michael Wardian, a 42-year-old ultra marathoner who has a day job working as an international ship broker. From the first race in Antarctica where the windchill sent the temperatures to -30C to the last in Australia, Michael set a blistering pace for each race. He won all 7 stages of the challenge. Michael set a world record for the average time for completing each of the 7 marathons – 2:45:57. Michael’s overall time to complete the 7 marathons on 7 continents was 6 days 7 hours and 25 minutes. Michael is no stranger to world records. In 2007 Michael set the record for running the fastest marathon while pushing a stroller with his son in it. He even finished that race in third place. In 2015 Michael set the world record for the fastest 50K run on a treadmill in 2:59:49. In 2016 Michael set the record for the fastest runner to complete each of the 6 Abbott World Marathons (Tokyo, Boston, London, Berlin, Chicago and New York) in one calendar year, averaging 2:31:09. I am not sure what is left for Michael to run. He has run the most challenging ultra marathons all over the world. He even ran at the North Pole (in the 2014 North Pole Marathon). Michael isn’t the type to stay home, running local 5K and 10K races. In a recent interview, Michael said he likes to do stuff that scares him. I don’t doubt for a moment Michael has something he wants to try. No matter what it is, I will be cheering for him. He is an incredible athlete.